A few weeks back, Charles Selle, a writer and editor for the Chicago Tribune Lake County News-Sun, wrote an Op-Ed calling for the total demolition of the old Carnegie Library in Waukegan, Illinois. Selle said it was time for the city of Waukegan to surrender the long-vacant building on the bluff over-looking Lake Michigan and to bring in the wrecking ball. Ray Bradbury taught me many things, among them, he often told me that we must look to our past to better understand our future. For this reason, in my first book on Bradbury, I called him a “nostalgic visionary.” Ray got the connection between the past and the future. And this is why Selle’s ridiculous call to “raze the edifice” of Waukegan, Illinois’ historic 1903 Carnegie library building is short-sighted and, frankly, emblematic of Waukegan’s frustrating inability to capitalize on its own crown jewel lakefront location and its remarkable history. Cities large and small across the nation are embracing historic revitalization and renovation, attracting artists and entrepreneurs, restaurateurs and urban visionaries who see the connection to the past and the future. Selle’s assertion that the city is “hanging on to the past” with the long-abandoned Carnegie building is correct. Yet he misses the point entirely. Waukegan should hang on to its past. Selle doesn’t even propose a replacement suggestion for the location, instead only calling for the complete demolition of a building with landmark status. The fact of the matter is that the current plans to house the Ray Bradbury Experience Museum in the Carnegie is the best chance to finally renovate the old biblio-gem, to raise the needed funding, and to properly honor one of the world’s great, inspiring imaginations — Waukegan’s Ray Bradbury. The RBEM (of which I am an advisor) has kicked off an ambitious fundraising campaign and has impressive initial designs for its exhibits that will honor Bradbury, his work, his life and his love of creativity and storytelling. The plan is to ultimately house the RBEM in a totally refurbished Carnegie building. Granted, there is a long way to go. This is going to be serious challenge. Waukegan has long dreamed of restoring the Carnegie building and repeatedly fallen short. But now is not the time to give up on this singular monolith to literacy and imagination. No way. Ray Bradbury knew a thing or two about the future. The author of such timeless works of imaginative literature as The Martian Chronicles and Fahrenheit 451 has been hailed a visionary by Presidents and renowned artists. His legion of fans includes everyone from Walt Disney to Steven Spielberg; Mikhail Gorbachev to David Bowie—just a small representative sampling of fellow visionaries. Bradbury told me on many an occasion that Waukegan had done things in reverse order. He posited that coffee shops, restaurants with al fresco dining, an ice cream parlor and a cozy bookstore should have come before the 2004, $23 million-dollar renovation of the old Genesee Theater (where he attended many films and performances as a child) so that theater attendees had places to go before and after shows rather than fleeing what is, candidly, today a late-night ghost town of gated storefronts and “For Lease” signs. Bradbury lamented the ghastly boom town outlet mall west of Waukegan, maintaining it syphoned pedestrians and consumers away from the downtown corridor. Finally, Ray Bradbury called for the total restoration of the old Carnegie library on the corner of Sheridan Road and Washington Street. Bradbury was keenly aware of Andrew Carnegie’s philanthropic heroism, single-handedly funding the construction of 1,689 libraries across America. (He built an additional 900 libraries around the world.) Bradbury foresaw that Waukegan’s revitalized downtown corridor could be bookended by the Genesee on the north, and the Carnegie on the south. As Bradbury’s authorized biographer, this is Waukegan’s moment. This is the city’s chance to totally honor its native son, the way other municipalities have honored their local literary heroes, from John Steinbeck, Charles Schultz, Laura Ingalls Wilder, Ernest Hemingway and many others. 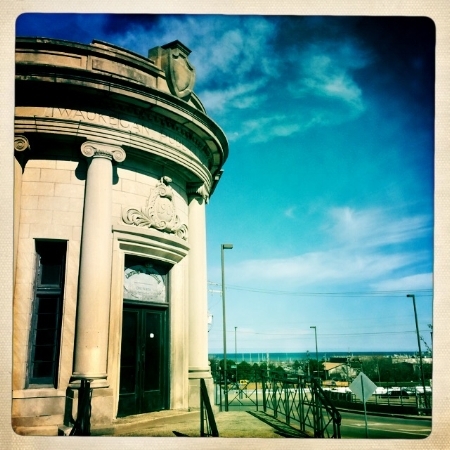 It is also an opportunity to save the beautiful Carnegie building, a truly unique structure for many reasons, notably its location on a bluff and its architectural design. Even beyond Bradbury, the Carnegie is a structure of historical significance and beauty. I have spent the last decade visiting Carnegie buildings around the country and the structure in Green Town is singular. I called for the restoration of the Carnegie building in a 2010 blog post surrounding the release of my book Listen to the Echoes: The Ray Bradbury Interviews. It seemed to me back then, as it does now, that the Carnegie is just one component in a strategic plan to revitalize this great city on the lake. Along with luring more retail and restaurants downtown, the city needs to finally commit to cleaning up the long-blighted lakefront. An outdoor band shell in a centerpiece park would be a remarkable start. The Waukegan Carnegie was the inspiration for the library in Bradbury’s classic 1962 novel of American Gothic, Something Wicked This Way Comes. He credited the library as being the spark for his imagination and his lifelong love of reading. He often spoke of walking through the front doors of the building and entering a world of wonder. Waukegan has a chance to create opportunities for future children to have the very same privilege. I have long maintained that, along with the strong and focused plans of the Ray Bradbury Experience Museum, the library should be a center for the imagination, hosting after school workshops for young writers, artists and dreamers. The building could host an annual “Green Town” Writers Conference and myriad other possibilities to further honor the legacy of Ray Douglas Bradbury, Waukegan’s beloved imaginative native, a visionary genius who loved the Carnegie Library not just for its past, but for its glorious future.